I was attending a WARP annual meeting. WARP, an acronym for Weave A Real Peace, is an organization that fosters a global market network of enthusiasts who value the importance of textiles to grassroots economies. I'd been meandering around the vendor hall, when the Oncebays' table caught my eye—Vilma's three dimensional embroidery on Saturnino's hand-woven fabric. Ants marching across bags, crocodiles engaged in... Combat? Conversation? I had to have one. But the price Saturnino had quoted was far too low. If that had been my work, I would have been insulted. It didn't even begin to do the work justice. I strongly believe in fair trade. I'll happily pay a couple extra dollars for fair trade coffee and twenty or more dollars for a beautiful ceramic bowl in a fair trade shop. But I have a particular weakness for ethnic textiles. As a textile artist myself, I am very much aware of the difficulties in pricing handmade items, let alone works of art. How do you put a price on years of study, hours of hand-weaving and needlework? How do you measure skill? How do you place a value on invaluable work? But I saw much more than skill, time, and effort in that lovely embroidered bag. The Oncebays are indigenous textile artisans from Peru, who replicate textile techniques of ancient Inca and pre-Inca civilizations. The entire Oncebay family was involved in the making of the bag, in spinning the yarn, natural dyeing, weaving, and needlework. Every step in its creation was steeped in tradition and history. 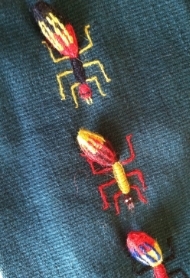 Textiles are an important component of the human experience. Their history gives us a frame of reference—how can we know who we are without referring back to our past, who we were? We can't afford to lose our textile traditions. Like many indigenous artisans, their work is their sole source of income. I want to encourage people like the Oncebays to continue their important work and enable them to earn a living through it. When I handed Vilma the eighty dollars, I was sending a clear message that I value her work and all it represented. Perhaps I should have offered her ninety or a hundred. After I left their table, the Oncebays raised their prices, and despite the price increases, their gorgeous textiles sold well—I was among like-minded people, members of WARP.